The history of McGregor dates back to one of Cleveland’s first private rest homes, the Home for Aged Women, The Amasa Stone House endowed in 1877. Tootie McGregor, established The A.M. McGregor home in 1904 to honor her late husband Ambrose, a close associate of John D. Rockefeller. The vision of The Gardens originated with the merger of these two fine institutions. Construction started in 2001 and continued until February 2004 when the staff and residents of the two legacy facilities moved in. Life at McGregor is safe, comfortable and convenient. It’s a place to make memories. So come and discover for yourself why so many love to call McGregor home. The McGregor Foundation, established in 2002 as a private grantmaking foundation, evolved from a history of more than 125 years of providing distinguished care for seniors at the A. M. McGregor Home in East Cleveland and the Amasa Stone House in the Glenville neighborhood of Cleveland. Tootie McGregor Terry founded The A.M. McGregor Home (McGregor) in 1904 in honor of her late husband, Ambrose, as a rest home for “gentlewomen who could no longer care for themselves.” Ambrose McGregor, a close associate of John D. Rockefeller, had served as president of Standard Oil of Ohio. In establishing the organization, Mrs. Terry donated the land owned by the McGregor family that now anchors the organization’s 32-acre East Cleveland campus and funded construction of the first Home. She also created a generous endowment to ensure continued longevity and success. 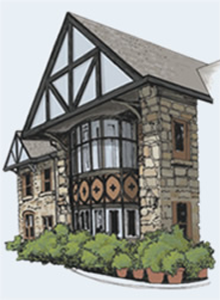 In 1987, The A.M. McGregor Home merged with another distinguished long-term facility, the Amasa Stone House, established by Mr. and Mrs. Amasa B. Stone in 1877. In February of 2004, the residents and staff of the McGregor Home and the Amasa Stone House finally came together in a beautiful new nursing facility on the McGregor campus, The Gardens of McGregor & Amasa Stone. In 1999, the McGregor Board of Directors adopted a new strategic direction for the organization to specifically focus on “supporting seniors in need and those who serve them.” The McGregor Foundation, with a separate Board and endowment, carries McGregor’s mission to all of Cuyahoga County beyond the organization’s East Cleveland campus. In addition, The A.M. McGregor Home will continue to own and operate senior housing and care facilities appropriate to the needs and means of the communities that they serve.